Here's the Cobb-Hepburn c. 1780, in Tinmouth, Vermont, as it was being dismantled last winter. 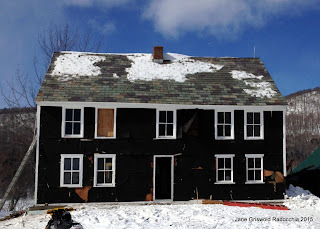 This front elevation feels bare and stark, less sophisticated than similar houses built at the same time in New England. The 4 closely paired windows on either side of the facade, and the wide expanse of wall between the windows and the door seems 'not quite right'. As I travel, though, I see the same spacing on other houses near by. Am I seeing a local variation? 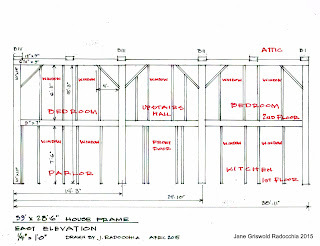 the same framer working on many houses? 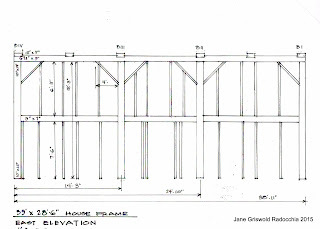 The frame is well built even though it was completed in stages. The geometry, however, is rudimentary. 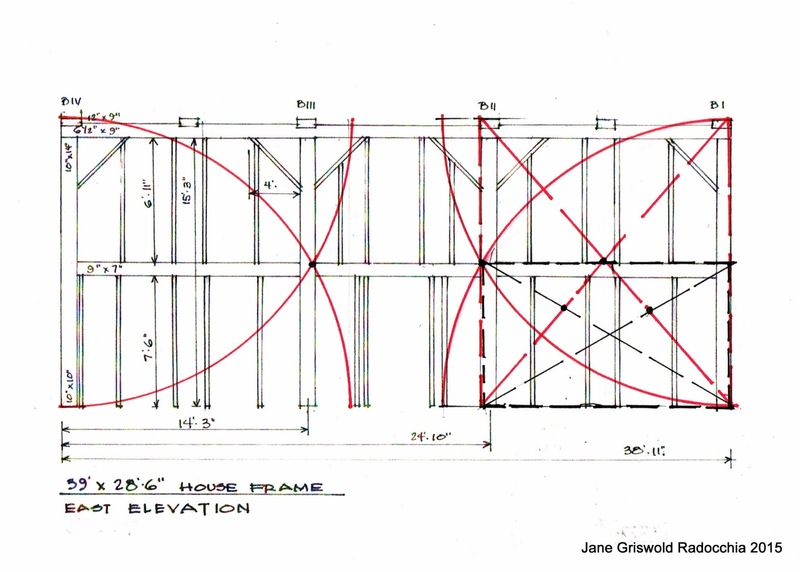 The plan for the posts and beams begins with squares, crossed to create a rectangle. 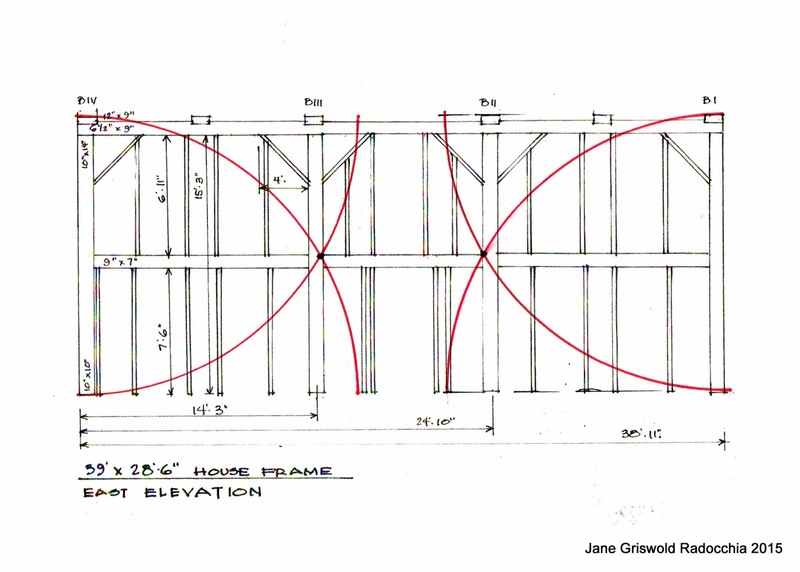 The distance they are crossed is based on the arcs used to lay out the square - one of the first manipulations of practical geometry that an apprentice would have mastered. 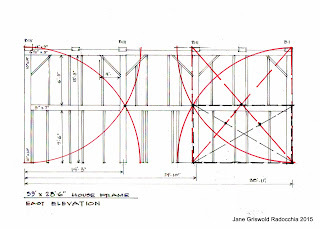 The first plan shows the posts and beams with the crossed squares in red. 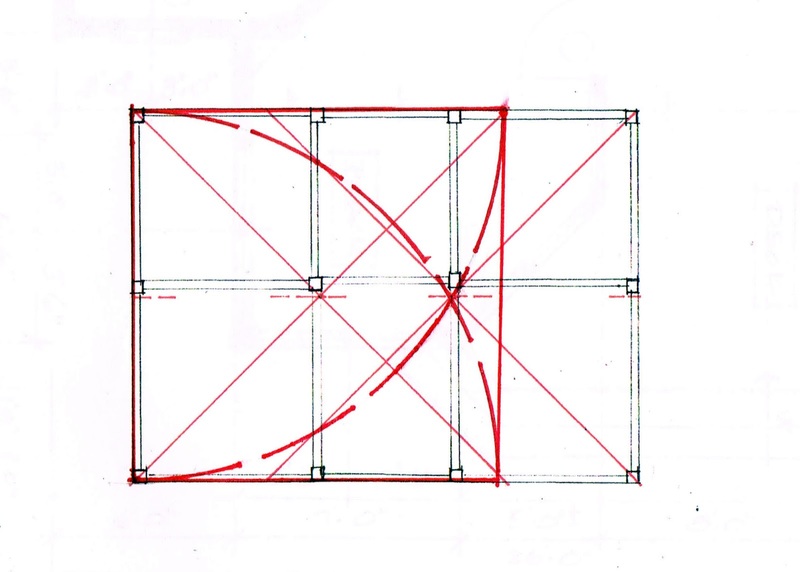 The second plan shows how the width the squares are crossed was determined by the crossed arcs - dashed red lines - of the squares. 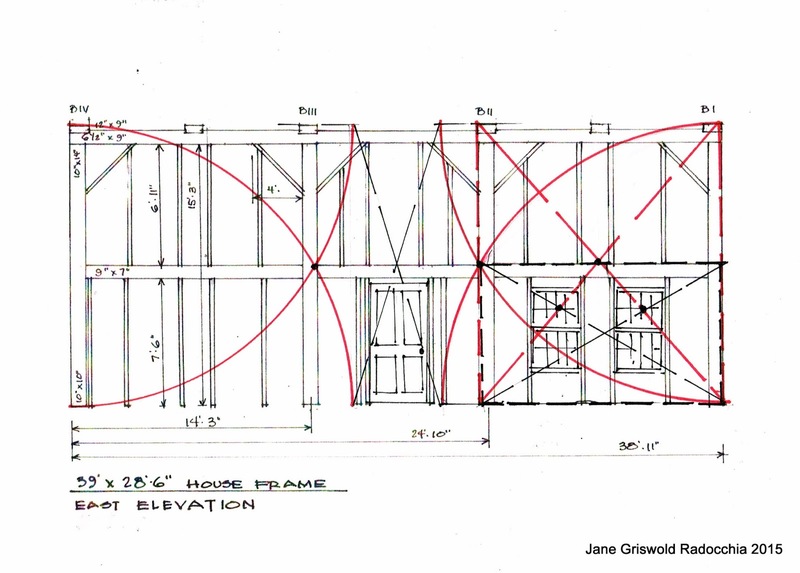 Was the framer never taught the geometry? 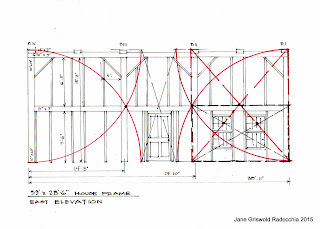 He was capable of quality timber framing; he must have served a apprenticeship. Was his training interrupted by the American Revolution? What he uses here are only the very elementary forms of practical geometry. Here is the first page of Biddle's Young Carpenter's Assistant. published in 1804. Biddle wrote his book for carpenters like the man who framed this house. To see the bibliographic information about Owen Biddle's book please see the links at the end of this post. 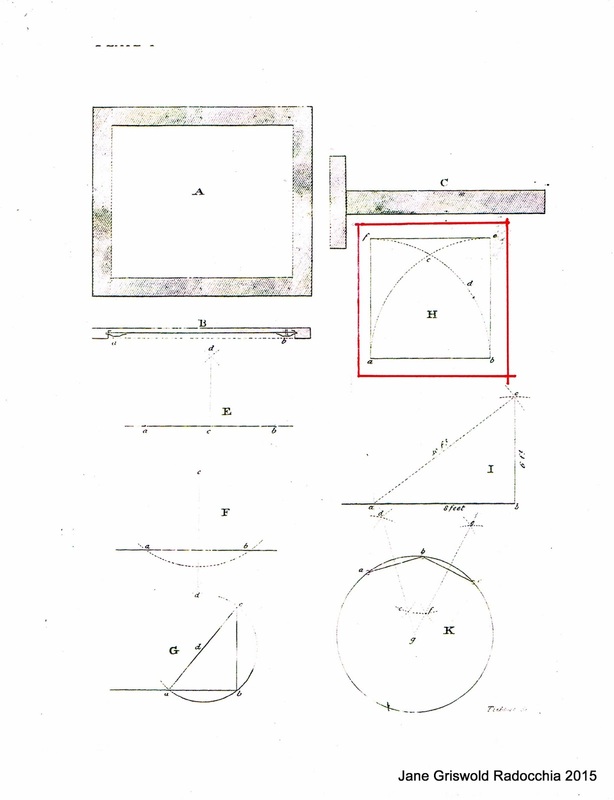 After explaining how to make a drafting board, fix paper upon it and make a T square - A,B, and C, - Owen Biddle lays out solutions "to some of the most useful geometrical problems, which every Carpenter ought to be acquainted with." E: how to raise a perpendicular, F: how to let fall a perpendicular, G:how to add a perpendicular at the end of a line. 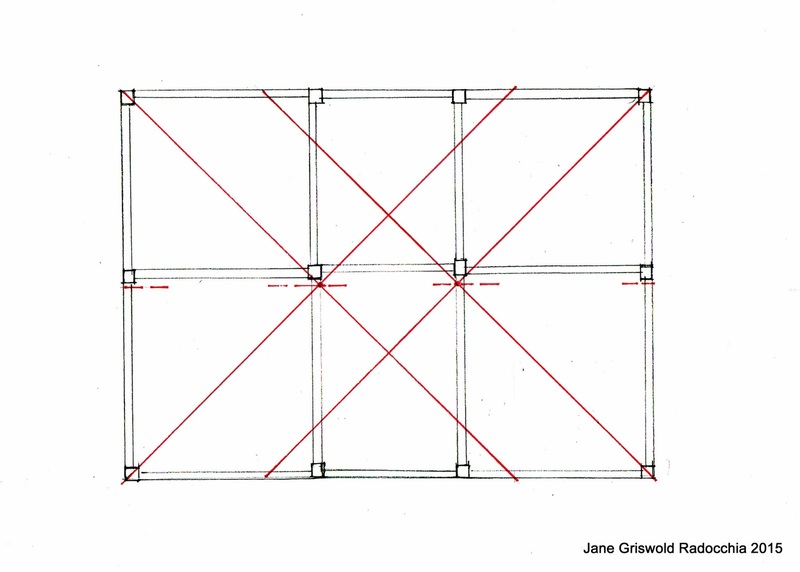 how to layout out a square. I shows how to draw a 3/4/5 triangle which will always have a right angle. J shows how to divide a circle into 12 equal parts. 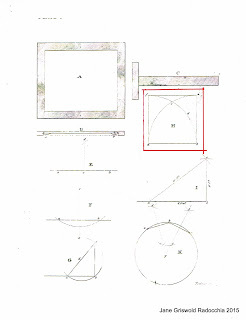 Very simple work with a compass - and the geometry used in the design of the Cobb- Hepburn House. 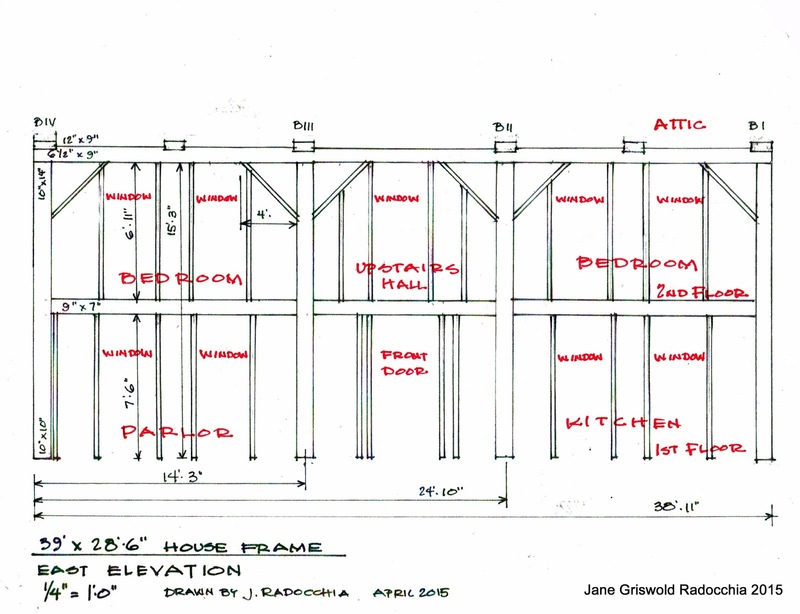 I have labeled the floors, the rooms, and the windows and door on the frame for easier understanding. 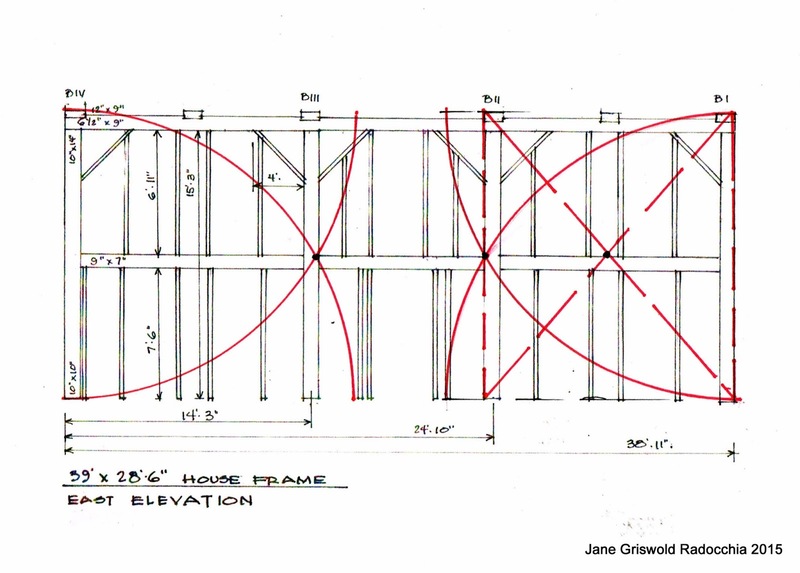 The floor plan used the intersection of the arcs of the square based on the width of the house for the placement of the interior beams ( BII and BIII). To read the 2 previous posts which discuss this please see the links at the bottom of this post. 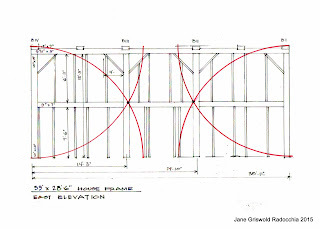 The front elevation uses the same geometry - the intersection of the arcs derived from the height of the house is both the edge of the posts for BII and BIII and the top of the 2nd floor plate. See the black dots where the arcs cross. The framer next needed to place the windows and the front door. He 'crossed' the rectangles (BI to BII on the right, BIII to BIV on the left) on either end of the front wall. They cross in the center of the shape, which is also the 2nd floor plate. Upstairs and downstairs windows are symmetrical to that crossing. I have outlined the right side with a red dashed line and added the diagonals. 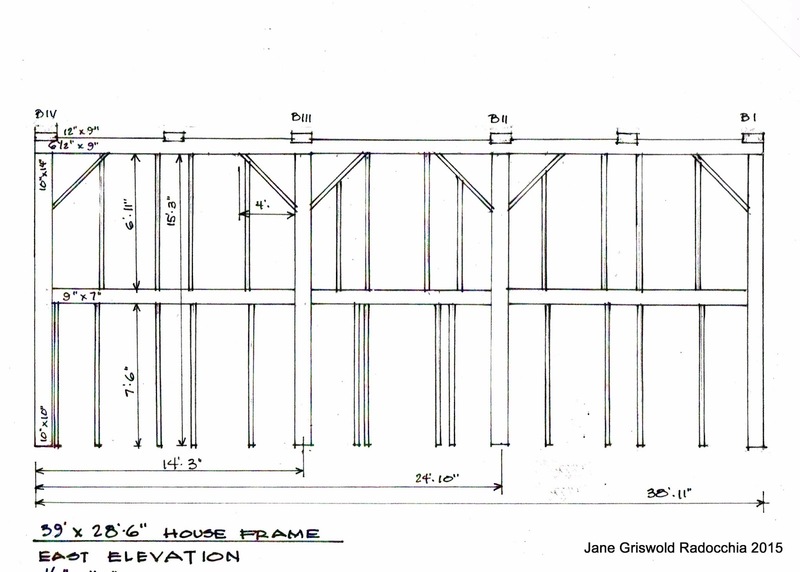 Then it was easy for the framer to 'cross' the lower half of the rectangle. I drew it with black dashed lines. 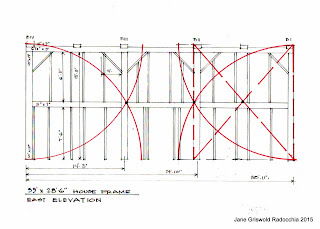 Where the red diagonals and the black diagonals cross is the center of the window frames. The location of the door is similarly found by dividing the left over center space in half.